This will be the last post about what we did in New Zealand…makes me kind of sad all over again to say goodbye to our Kiwi adventure! 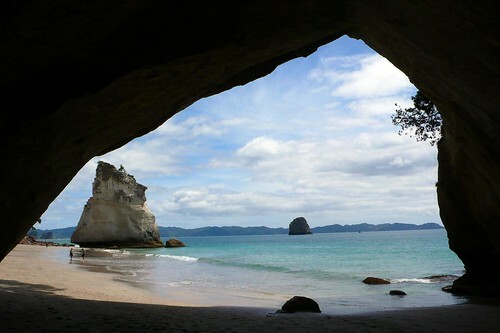 Our final stop in New Zealand was the Coromandel Peninsula, which is about 1 hour east of Auckland. But before that, we boarded the ferry in Picton and once we got dropped off in Wellington, we drove up the west coast a ways looking for a freedom camp spot for the night. We found it in a place called Hokio Beach, where you are allowed to drive straight onto the shore…there are speed limits and everything. It turned out to be quite a scene as the night wore on…lots of teenagers doing donuts on the beach and people driving super fast just because they can. 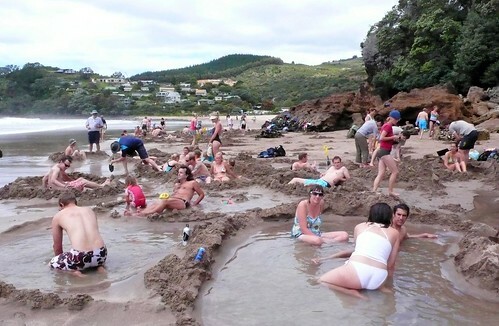 I guess Kiwis are just as excited about driving on the beach as we were! 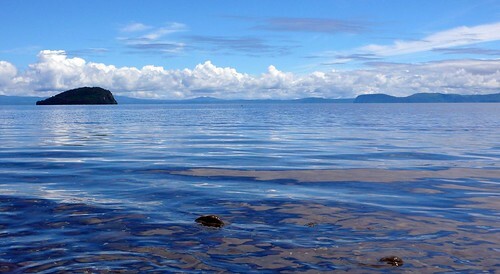 The following day we drove to Lake Taupo, which is right in the middle of the north island. It was raining pretty hard when we got there so we needed a bad-weather activity for the day. Luckily this entire region is known for its hot springs. We ended up in a town called Tokaanu, though we just hung out in a hot pool and not in the mineral waters because we got a little freaked out by all the signs warning us not to put our faces in the water due to amoebic meningitis. I can attest that on a rainy day, the hot pool felt just as nice. 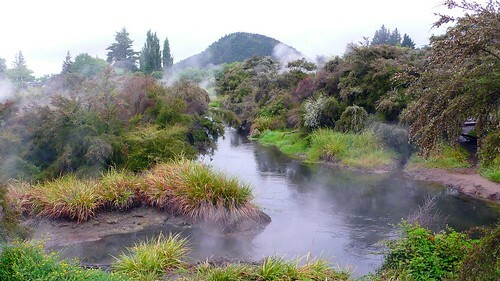 Steam coming off the pools in Tokaanu. Lake Taupo is very pretty, but also very touristed. Everything was really expensive here. We read about a cool place called Orakei Korako, which is a geothermal mineral formation with spectacular colors. 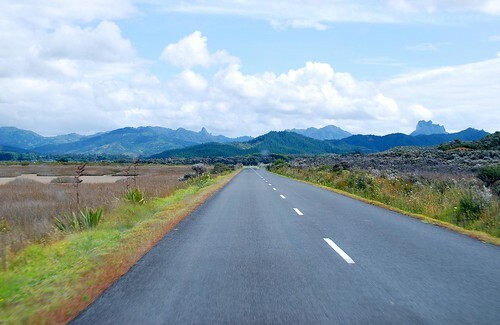 However, when we got there, the entrance fee to the park was NZ$31 per person. This was more expensive than our Milford Sound cruise! So instead of hanging around Lake Taupo, we opted to head straight for Coromandel and spend a more relaxed few days exploring that area. 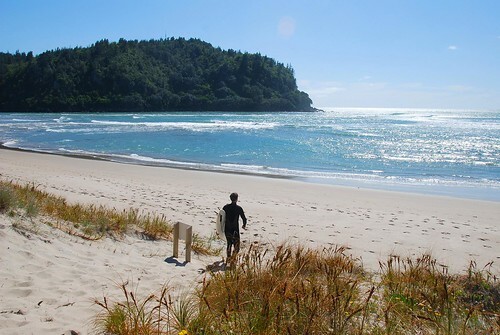 We hadn’t quite gotten to the peninsula yet when we stopped at deserted Waihi beach to discover…a swell! Finally! Jeremy was so excited he ran straight for the water. …and then came back, exhausted after 20 minutes. 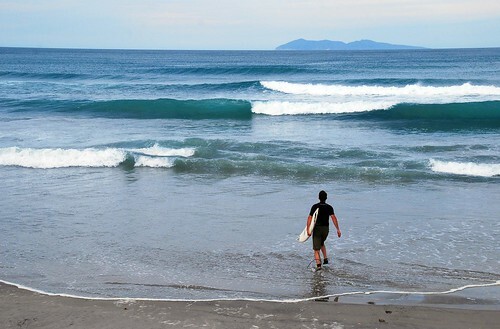 He said, “all those flat days, I should have been out there paddling, getting in shape!” A surfer’s hindsight is always 20/20. Actually, it was a good thing he didn’t stay out there too long, because we drove further north that day, and the waves were even better…so out Jeremy went again. 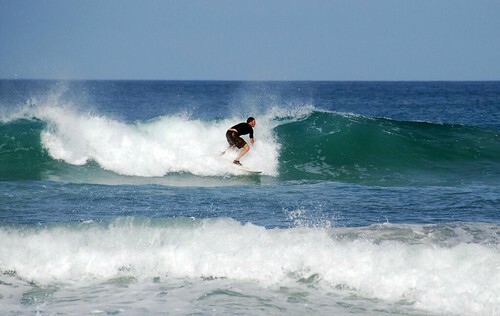 Jeremy heading out for the second surf of the day. 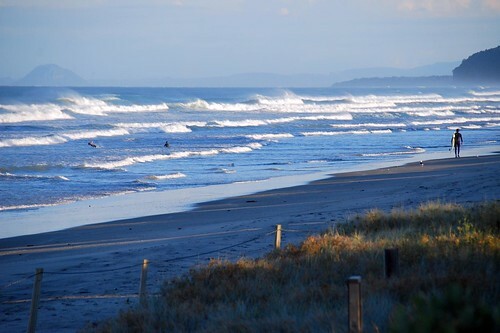 And the following morning, another session off a point break at Whangamata. 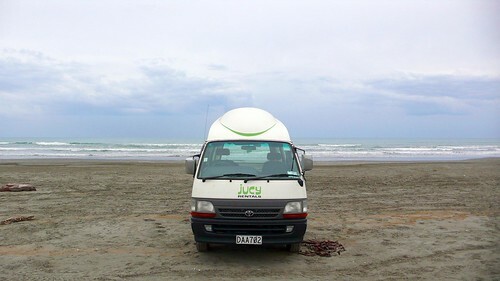 After J got his fill of surf, we headed for Hahei Beach (not sure how this is really pronounced, but a nice German couple we met in Lake Taupo was calling this “Hey! Hey!” so that’s how we pronounced it). 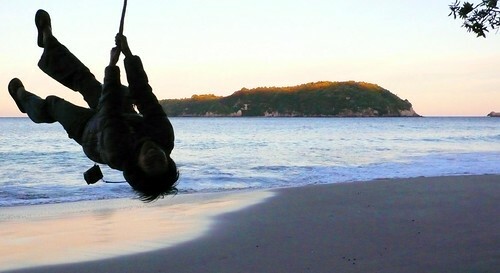 Hahei is an incredible beach…we took a walk at sunset and found a tree swing, and then spent about 20 minutes trying to take silly pictures on it. …and Hot Water Beach, where you can dig yourself a natural hot spring on the beach +/- 2 hours on either side of low tide. There were a lot of people doing this and we tested the waters…it really was hot! We headed straight from Coromandel Peninsula to the airport…we wanted to squeeze the most we could out of this incredible landscape before we hopped on a plane for Sydney. Your photos are stunning! I’m loving all these updates. Penguins, sea lions, digging your own hot tub and of course, the swingshot. Great stuff.